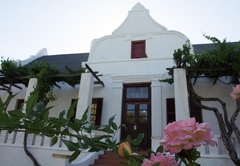 De Kombuys Estate is a highly recommended property providing self catering in Oudtshoorn for tourists visiting the Karoo region. 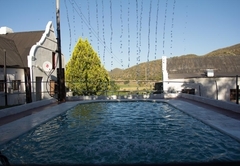 De Kombuys is an eco orientated farm conveniently situated only 3km from the world renowned Cango Caves. 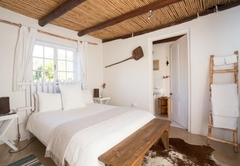 Whether you are looking for peace and tranquility in the beautiful natural surroundings, or want to experience the culture of a working organic farm, we have the accommodation option to suit your needs. 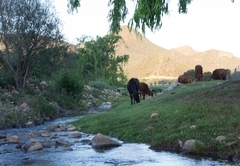 Nestled in a picturesque Cango Valley, De Kombuys offers you the opportunity to take in the rustic atmosphere of farm life while enjoying the comforts and luxuries of home. 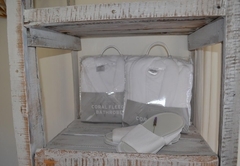 Our variety of sleeping options caters for couples, singles and families. 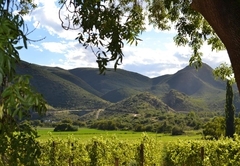 Come and enjoy Klein Karoo living at its leisurely, unpretentious best. 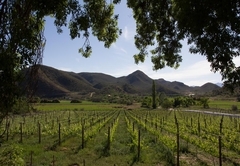 Our two Vineyard Cottages (Die Bakhuis and Ou Skooltjie) are situated at the edge of the Shiraz vineyard and have a truly magnificent view of the surrounding mountains. 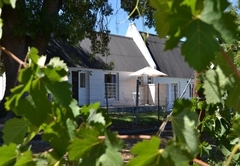 De Kombuys also offers a third cottage, Die Peperhuisie, named so for the shade it receives from the old Pepper tree next to it. 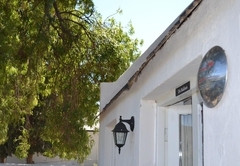 Die Bakhuis offers one double en-suite bedroom and a comfortable living area fitted with a kitchenette. 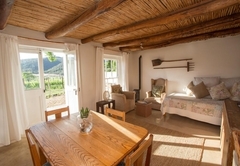 The living area also provides an adjacent ¾ bed (day bed or additional sleeping option). 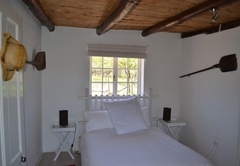 Die Ou Skooltjie also has a bedroom with double bed and en suite bathroom. 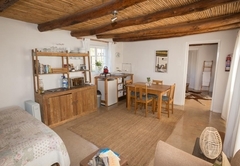 The living area has a kitchenette and dining area as well as large corner couch that can be converted into a additional double bed. 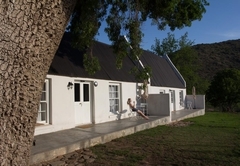 The cottages are over 100 years old and reflect their previous uses, a baking house and a school room in their names. 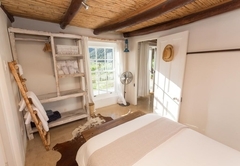 Thick clay walls and classic sash windows complement the rustic ambience of the farm-style decor. 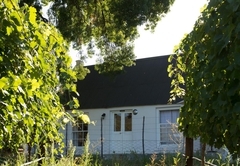 A braai on the stoep, overlooking the Shiraz vineyards, is a must during your stay. 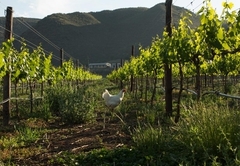 Curious visitors might want to explore some of the eco-driven activities at De Kombuys, such as our large-scale earthworm operation. 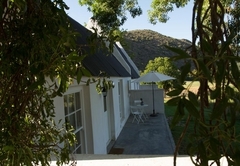 Other guests might simply want to sit back on the veranda and enjoy the abundance of birdlife in the area. 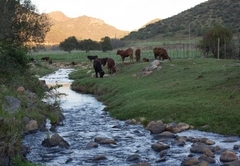 De Kombuys strive to provide our guests with a relaxed, authentic living experience, surrounded by the beauty of the landscape, and within reaching distance of the realities of Mother Nature. 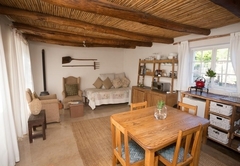 Die Bakhuis offers one double bedroom (en-suite) and a comfortable, open plan living area fitted with a kitchenette, dining and sitting area. 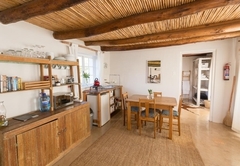 The living area has a Â¾ day bed that can be converted into an additional sleeping option, if required. 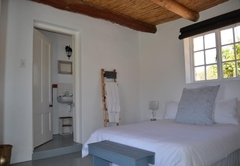 Die OuSkooltjie also offers a double bedroom (en-suite). 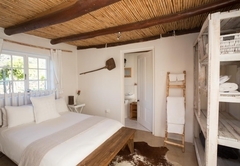 The living area of this cottage contains a kitchenette, a dining table and a corner sofa (high-density foam) that can also be converted into an additional sleeping option, if needed. 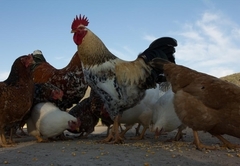 The whole experience of a farm is fantastic, with its detail and service. Excellent breakfis. 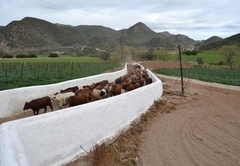 Response timeDe Kombuys Estate typically responds to requests in 5-10 minutes.